Revenue reached new heights in Apple's holiday 2017 quarter, but unit sales of the iPhone fell year over year, reflecting the premium-priced lineup of the iPhone X, iPhone 8 Plus and iPhone 8. Following the publications of its first fiscal quarter 2018 results, the company held a conference call with media and analysts, and notes of interest follow. Fifth consecutive quarter of accelerating revenue growth. This quarter was 13 weeks long, year-ago was 14 weeks. iPhone X was the best-selling smartphone in the world in the December quarter, according to Canalys. "It has been our top selling phone every week since it launched," Cook said of the iPhone X. Revenue for newly launched iPhones was highest for any lineup in company history. Great excitement around augmented reality, Cook said. 2,000 ARKit apps in the App Store. 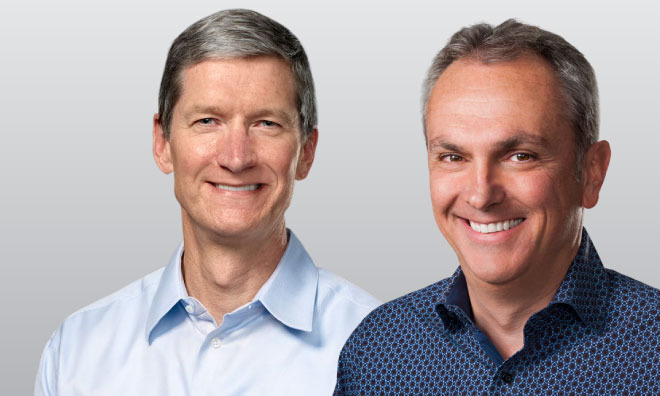 Apple surpassed 240 million paid subscribers across services in the quarter, up 30 million. The wearable's best quarter ever saw 50 percent growth in both revenue and units for the fourth quarter in a row. Strong double-digit growth in every geographic segment. Series 3 models were more than twice the volume of Series 2 a year ago. Worldwide, about half of iPad sales were to first-time tablet buyers or those switching to Apple. Third consecutive quarter of revenue growth for the iPad. LensCrafters plans to use 7,000 iPads for digital eye exams.